Well.. as you know it is Christmas in our dolls’ house too. Last week we made some little Christmas presents. I hope you all enjoyed your Christmas festivities!! 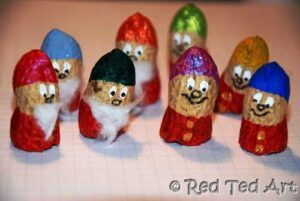 Today we have little Peanut Puppet Dwarves for you. 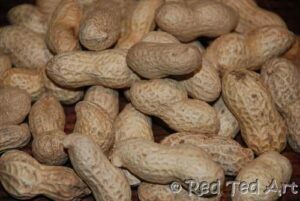 I apologies in advance for those of your with Peanut or nut allergies in the family. Please do NOT read on. 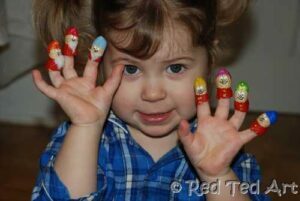 Pip Squeak ADORES sticking the lids of pens on her fingers. She is forever doing it (which can be a little boring when you have to match all the pens and lids back up again). So when I saw Peanut Puppets on my crafty journey, I knew I had to make some. I confess however, that I cannot remember WHERE I saw them. I think it was in a craft book (I get to review them every so often). So, I apologise for not crediting someone properly. The original I saw, were made for “Halloween” and included a little bat and ghost. 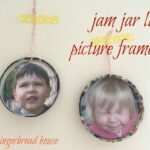 Also.. this is a craft that I ended up making FOR the kids. Though Red Ted did help me paint he dwarves coats a little. I do want to make some with them to do.. and we will probably have a go at creating little imaginary beings over the coming days. 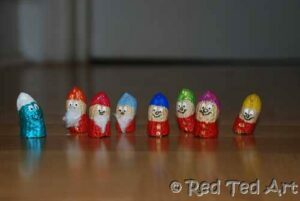 But I really fancied some dwarves… especially as the peanut shape is PERFECT for dwarf hats! 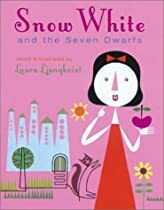 Snow White and The Seven Dwarves, by Laura Ljungkvist. Well… do I really need to tell you the story of Snow White? Surely, *everyone* knows this classic Brother Grimm’s tale. It has of course been popularised by Disney and many images of Snow White that will pop into your head when her name is mentioned are indeed Disney’s! We have a collection of Grimm’s tales in German at home. But as a fan of Laura Ljungkvist (you may remember her Follow The Line books) I also love this version of Snow White. As with previous titles you can “trace” the story by following the line throughout the book. Quirky. Bold. Wonderful. And certainly a change to your standard Disney! If like us, there is always a bowl of nuts to crack and peel at Christmas, then these are for you. They are an awesomely thrifty craft, as you get to still eat your nut! And then play with the “waste”. 2. Look at your peanuts – what creatures do they remind you of? 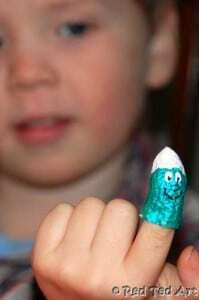 I actually made a Smurf first. Just irresistable. 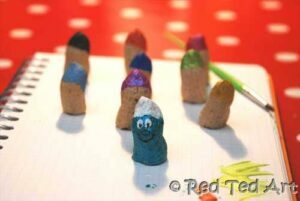 But my children don’t know the Smurfs, so there was no point in making more. Dwarves it is. 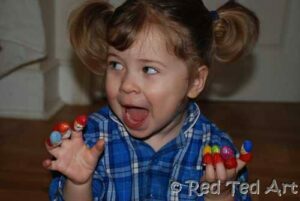 Which is great, as Pip Squeak is learning her colours and Red Ted can practice counting. 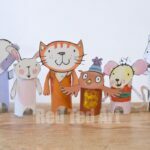 Would love to see any special finger puppet creations! Or have you made something out of “something unusual” like peanuts? Wow! 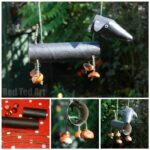 What a coool recycling craft! 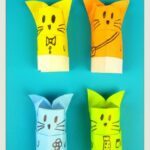 you are the queen of simple and adorable crafts! I love Pip squeak\’s laugh! So imaginative!! This will be great for storytelling. Your daughters\’ glee is contagious! Esther – yes, Pip Squeak\’s delight was rather special! Rebekah – most definitely.. I will have to come up with lots of new characters so we can make up lots of stories. 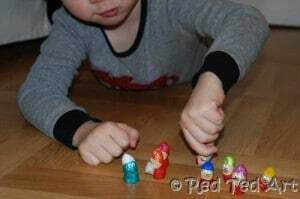 At the moment I sing \”7 little dwarves, standing on the wall..\”. Not that imaginative. Sigh! Oh, this craft is just adorable. I have to try it. The extra bonus will be that my kids have never seen peanut shells – I always buy shelled nuts. I bet they will get a kick out of this! I LOVE the pictures – SO cute!!!! 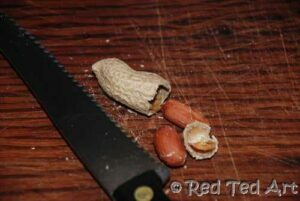 Oh yes, if they have never seen a peanut shell it really will be fun! What gorgeous photos of PipSqueak! 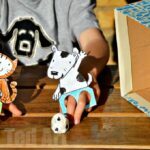 Cute idea for easy puppets too! Thank you Anna, I was rather pleased of the photos of Pip Squeak. She was a good model! These are so cute, looks like a bunch of fun to play with. Oh, such cute peanuts and such cute kids! I\’m so excited about this fairy tale from Laura L? (I\’m not going to attempt the last name;) We love her books. I have to get this one! That is very creative. I love it! Aaah thank you everyone! And yes, Jackie, big thumbs up for the book – especially if you are fan anyway! those peanut puppets are the cutest thing ever. So happy Goblin doesn\’t have any peanut allergies, we\’ll be making some of them as soon as I can track down some peanuts. Ones with shells on are surprisingly hard to come by. Tell me about it! I find that in the Uk you ONLY get them at Christmas or in the speciality shops that have \”produce from around the world\”! They are brilliant. I\’m thinking I need to sign up for updates from this site as I have 4 boys that would love all these things you are making. Thanks for sharing. Aaaah how fabulous and great to have you on board!! wow! great idea! i learn something new everyday! I am your newest follower..pls follow back if you can! they\’re adorable but we couldn\’t do them with our peanut allergies 🙁 I might see if acorns work as well. Will do! Thanks for the invite! 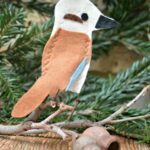 Those little puppets are too cute…definitely going to have to try this one! That is the cutest idea EVER!!!!!!!!!!!!!! It is going to be featured this weekend! Thank you for sharing your ideas with us on The Sunday Showcase Have a happy New Year friend! Aaah thank you 🙂 much appreciated!! How did I not see these before?Fantastic! 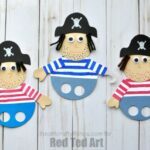 Wow, I chanced upon your blog recently and have been amazed and blown away by all the fantastic craft ideas here. I love art and craft and it\’s so nice to be able to read on all the different ideas. Have nominated your blog for the Versatile Blogger Award, details here http://ahappymum.blogspot.com/2012/01/versatile-blogger-award-it-just-made-my.html. Keep the great job going! 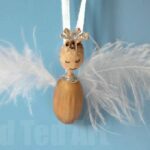 Hihi, I chanced upon your blog recently and am blown away by all the fanstasic craft ideas you have here. 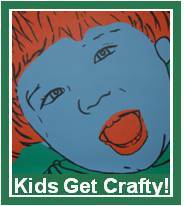 Yes, I love art and craft and it\’s awesome to read on all the different ideas. Have nominated your blog for the Versatile Blogger Award, details found here http://ahappymum.blogspot.com/2012/01/versatile-blogger-award-it-just-made-my.html. Keep the great work coming!